Once the warmer months are here then the Bees are the first to be seen around homes and gardens in the Manchester & Cheshire area. Whether its the Honeybee, Bumblebee or any type of bee, they can become a nuisance and a pest control service will be needed for the removal of a nest or hive. Here at Town & Country Pest Control we offer a professional and complete service for your home, business or workplace. As their name suggests, social bees live in groups. Honeybees are particularly sociable and can live in groups of up to 50,000 together in a single hive. 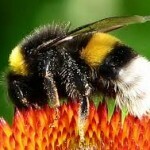 Bumblebees are also social, but live in smaller groups of 50-150. Both types depend on queen bees who lay all of the eggs for the group. Social bees are a common sight in our gardens and the most common are the honey, bumble or carder. In contrast, solitary bees live on their own. They can make burrows underground, or live in quarry faces, old wood, and even masonry. A female solitary bee builds her nest and provides food for her young without the help of any worker bees. Despite this some solitary bees may appear to live in colonies, with many bees making their nests close to each other in a suitable piece of habitat. There are over 250 kinds of solitary bee, but a few you might see are the Leaf cutter, Masonry or Mining bees. At Town and Country Pest control we can identify and remove a bee problem quickly with minimum fuss. To locate the nest, watch the flight path of the returning bees. If the bees nest is near your home, keep nearby doors and windows closed. If you suspect the nest is in the loft, take great care when entering the roof space as the bees may see this as an aggressive threat to their nest. Most bees are quite well behaved and do not impose any threat, but some species will become aggressive. Therefore do not attempt any DIY bee removal, leave this to a professionally trained pest control technician. This will usually be done by identifying the location and removing the complete colony. However if the colony "has" to be removed and the location cannot be identified, then spraying of an insecticide powder in or around the entrance of the nest will take place. This powder will then be taken into the nest by bees returning and entering the nest. To prevent bees from ever entering your home, look for small holes, crevices and cracks that has a hidden void behind it, the void (often cavities in walls) is the likely place where a bees nest is likely to be established. These holes, cracks or crevices need to be filled or repaired.